So, you've seen some of our progress so far for the baby's room! One other thing we've been trying to accomplish is adding some "modern" touches that still work with the vintage influences in the room. I've bought two things that seem small, but I think will make a big impact. 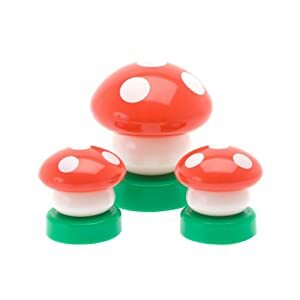 One is a set of three small touch lamps that are shaped like mushrooms. I first saw them on Ohdeedoh, and found them on Amazon for less than $20. Since there is no outlet in the closet of the baby's room, I put these on the tall chest in there and they are SO CUTE. I think the color and shape are modern, but speak well to vintage style, too. They give a nice glow and I think they will work well as night lights. So now we are looking for one or two more pieces of cool art for in there. And a nice mobile. One of our favorite boutiques in town is running a half off deal through Scoutmob, and we really really tried to find some good stuff but couldn't find anything that was right. We were tempted by a Jonathon Adler paper lantern (like this one) but in such a tiny room, a purely decorative anything has to be a big important decision. Of course, looking at it again, I'm thinking maybe we really need it... Isn't it so pretty? We looked at Kudzu Antiques near us, too, but just couldn't find the right thing. We've got a few months though, and we're both happy with the progress we've been making. Those mushroom lamps are so cute! Vintage Coconut: Thank you! I really can't take much credit since I found them on Ohdeedoh, but they are adorable.